The SOLIDWORKS SimulationXpress add-in provides first pass testing of your SOLIDWORKS Parts. Verify whether your design will work, and if it will behave exactly as you intend. You can determine whether your design places too much load on given components, possibly causing breakage. Quickly investigate the relative merit of a wide range of designs, thereby weeding out the worst designs and highlighting the best. Using design analysis to test your designs is much quicker and less costly than building and testing physical prototypes. Test radical new designs without cutting metal. These might be designs you previously would not have completed because they would be too tedious or time consuming to build and test. SOLIDWORKS SimulationXpress is suitable for stress analysis of simple parts, giving you the ability to simulate the effect of force or pressure loads on those parts. Once you have your stress results, SOLIDWORKS SimulationXpress can generate HTML reports and create SOLIDWORKS eDrawings files to document and communicate the results of the analysis. For SOLIDWORKS users who need additional functionality, it is easy to upgrade from SOLIDWORKS SimulationXpress to SOLIDWORKS Simulation Standard. Perform a first-pass design check on simple SOLIDWORKS parts. Determine the factor of safety of your parts. Easily document and share your results with HTML reports and SOLIDWORKS eDrawings Viewer. 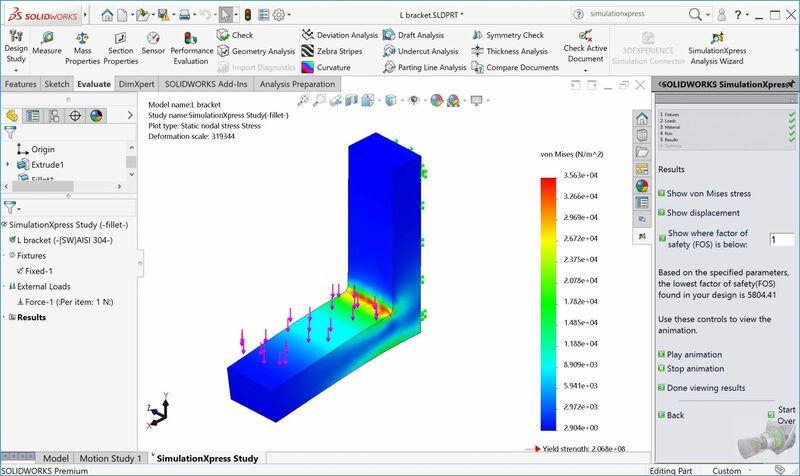 Enjoy the benefits of design simulation and analysis free inside SOLIDWORKS. Easily upgrade to SOLIDWORKS Simulation Standard if additional functionality is needed. What are the differences between SOLIDWORKS SimulationXpress and SOLIDWORKS Simulation Standard? The SOLIDWORKS SimulationXpress Add-in is part of the SOLIDWORKS Premium software bundle from Javelin. Interested in the SOLIDWORKS SimulationXpress Add-in?